Departed Lawrence, KS too late for the tornadoes in central Oklahoma due to ongoing midnight shifts and poorly anticipating early afternoon CI. Deroche and I dropped south to the KS/OK border in hopes continued moisture advection would improve ongoing elevated convection in northern Oklahoma near I-35. This also failed to materialize, so we targeted the approaching tor-warned “Guthrie-Stillwater” supercell approaching Pawnee, KS. Our first view of the updraft came around 5:15pm as the storm was departing Pawnee after both supercells had merged and the southern updraft became dominant. 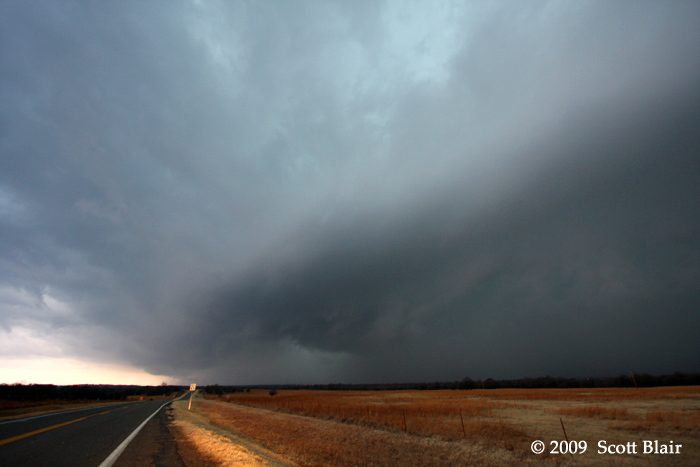 We stopped just south of Pawhuska, OK on Hwy99 and watched as the base became visible around 5:30pm. 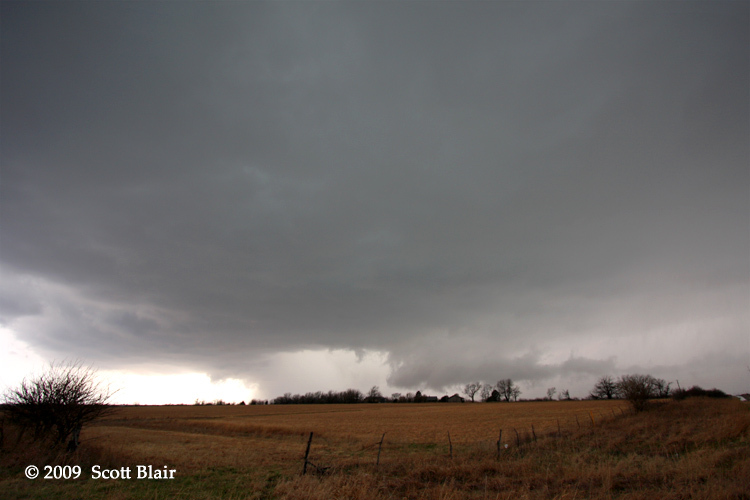 Rotation was evident within a notch where to the south, the RFD shelf was quickly advancing eastward. The storm overall seemed structurally-challenged, perhaps suffering from the earlier storm merger, newly generated nearby warm sector convection, and/or a transition to HP-like characteristics. We followed the storm north of Bartlesville, OK where we watched a barrage of CG lightning and 1.5" diameter hail stones as darkness set in. Departed Lawrence around midday with Leighton and met up with Deroche/Burtis in MO. Targeted near Nevada, MO due to the initial southern edge of weakened convective inhibition juxtaposed with a narrow theta-e axis riding northeastward from eastern Oklahoma into southwest Missouri. Fortunately, the southern end of convection developed near the target along Hwy 54 by late afternoon upon the approach of an arctic front. We flanked the convection by driving east on Hwy 54, stopping just east of El Dorado Springs, MO to observe interesting low level features and a few inflow tails. The storm appeared to be near surface based with occasional blocky scud that would become attached and ingested into the rain free base. We dropped south on Hwy 13 and watched the storm cross the road in between Collins and Humansville. The storm contained a rough-looking wall cloud with minor rotation, albeit apparently fighting the cold pool from precipitation to its immediate west. As the storm passed our location, we sampled the hail core and observed numerous 0.5” to 0.88” stones with a few as large as 1” in diameter. The precipitation came to an abrupt end and we ended the day as darkness was setting in and the storm was heading deeper into poor terrain. Departed Lawrence, KS shortly after noon along with Derek Deroche. Target was generally focused on south central Kansas in the anticipated late afternoon vicinity of the cold front, dryline intersection. However, convection developed earlier than expected and we focused on the enhanced cu near the dryline bend just south of the OK/KS border. 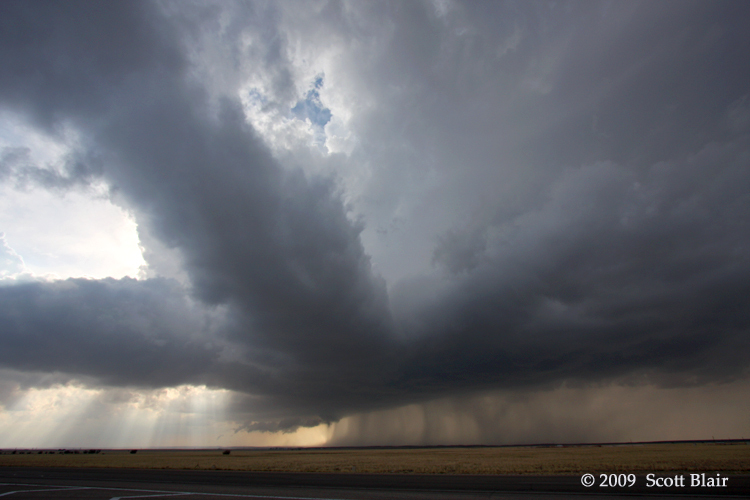 After roughly one hour of struggling and merging convection, a supercell evolved near Kingman, KS. The updraft finally came into view as the storm neared Burrton. Visual observations and radar showed a new, large updraft develop on the storms southern flank, which unfortunately brought an abrupt end to the well-organized nature of the storm. We followed it to Hesston, KS and decided to let go the pathetic shell of a storm. After a couple bags of Cheeze-Its and sweet tea, we dropped south to new convection near Medford, OK that appeared to have some potential of organizing based on 30 minute radar trends. As we drove through Udall, the activity quickly evolved into an impressive looking supercell that was approaching I-35 near the KS/OK border. We stopped 5 E Winfield, KS and watched the updraft to the southwest that was now tornado-warned. We observed what appeared to be a blocky wall cloud with a significant amount of precipitation wrapping around the feature near the Srother Field airbase. Thereafter, the precipitation nicely encircled the area of rotation for quite some time. We watched a new area of low-level rotation organize near Cambridge, KS with scud tags quickly converging and rotating about a central axis, but this too met a similar fate as precipitation rapidly masked this region. Following it northeastward, one last view of the updraft was found south of Severy, KS along Hwy 400. 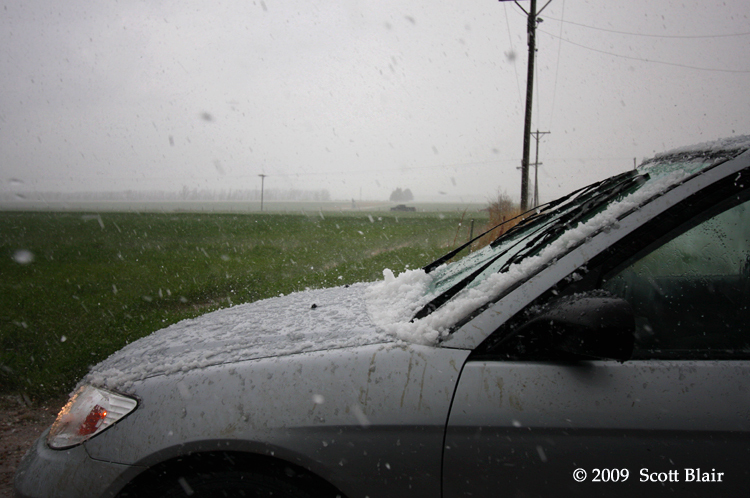 We ended the chase to the smell of hail-beaten Cedar trees both south and east of Severy. Departed Lawrence around 6:30pm with Deroche to intercept a developing line of elevated, low-topped convection across eastern Kansas with a primary purpose of storm/landscape photography. We drove underneath the multiple updrafts of the evolving line and chose to set up just west of the updrafts to maximize the potential color saturation from the lowering sun angle. We exited off I-70 at MM338 in between Paxico and Maple Hill, on the eastern edge of the Flint Hills, and drove south on a dirt road for a couple miles. 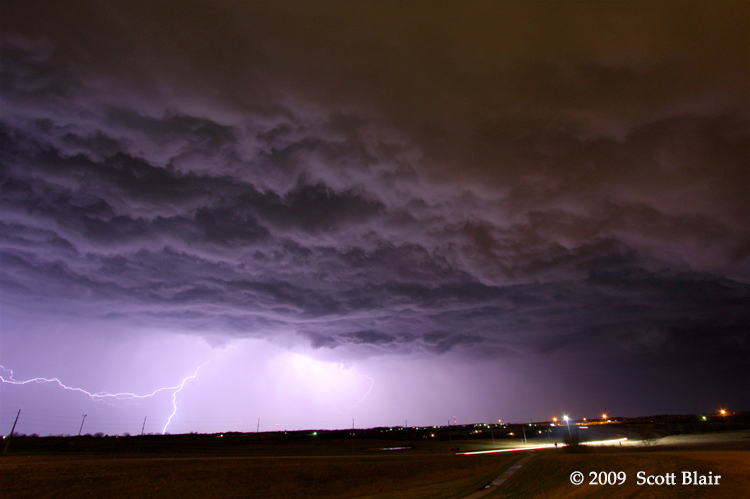 The convection quickly became linear and overall structure and lightning frequency improved by sunset. Following numerous stills, we relocated ahead of the line on the west side of Lawrence just after 8:30pm. By now, the low-level outflow had significantly pushed ahead of the precipitation cores, resulting in an impressive 'whales-mouth' shelf cloud structure. 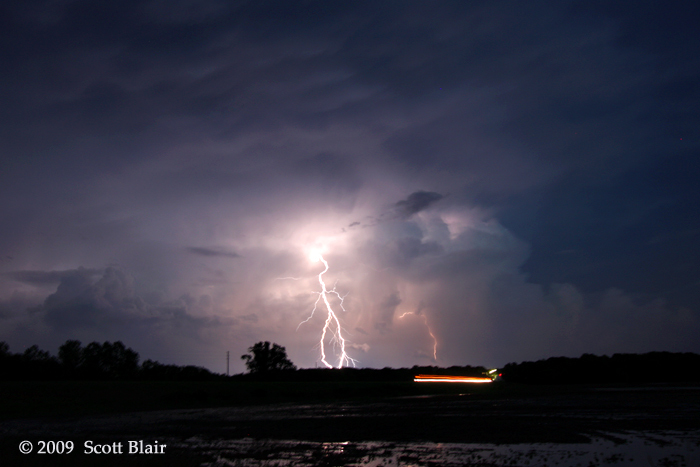 Lightning frequency had decreased relative to one hour before, but still sufficient for photography purposes. One cg-lightning struck one/more transformers creating brilliant green flashes underneath the shelf cloud just east of TOP. Overall, an enjoyable outing even in the absence of any severe weather. Torn between targeting near the occluding surface low pressure west of ICT or on the nose of the dryline bulge, Deroche and I elected the dryline play near Sedan, KS. Convection quickly initiated by mid afternoon and we jumped on developing convection along the KS/OK border, east of Arkansas City. 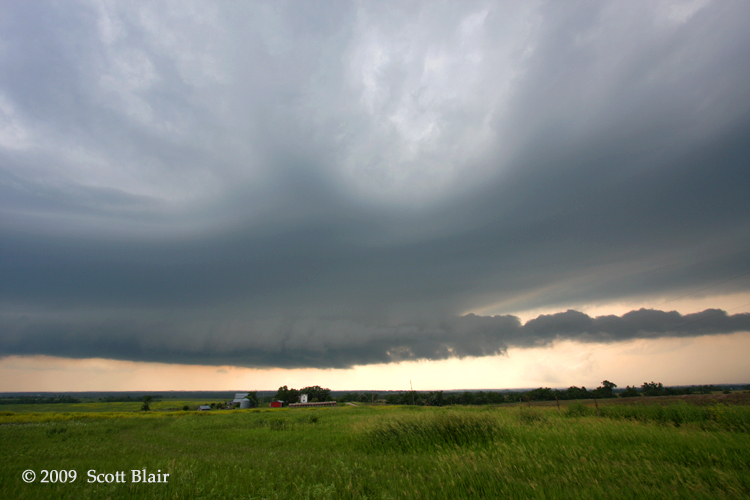 This particular storm quickly became dominant and formed a large rain-free base and healthy precipitation core. 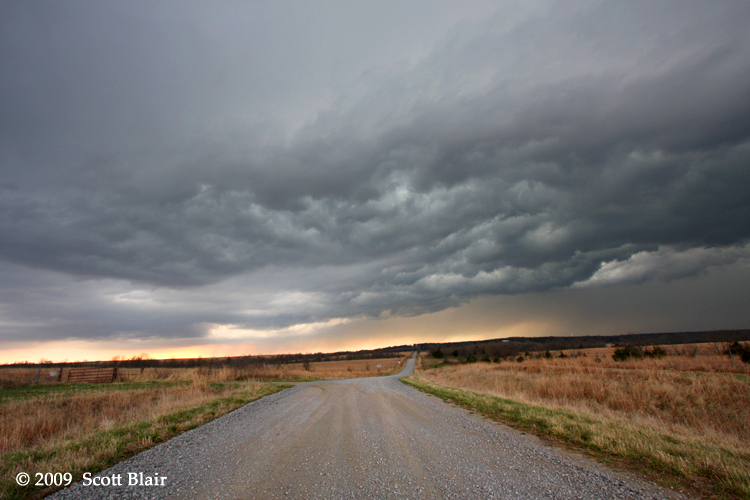 We moved north on a dirt road from Cedar Vale, KS to Grenola, KS and watched the storm organize into a decent supercell. Unfortunately, new convection upstream developed and became ingested into the storms inflow/updraft region, effectively bringing an end to any significant organization. With modest dewpoint depressions and marginal instability, the remaining convection quickly became outflow dominant. Photogenic scenery of the Flint Hills combined with a ragged shelf cloud was the highlight of the day near Fredonia, KS during the early evening hours. 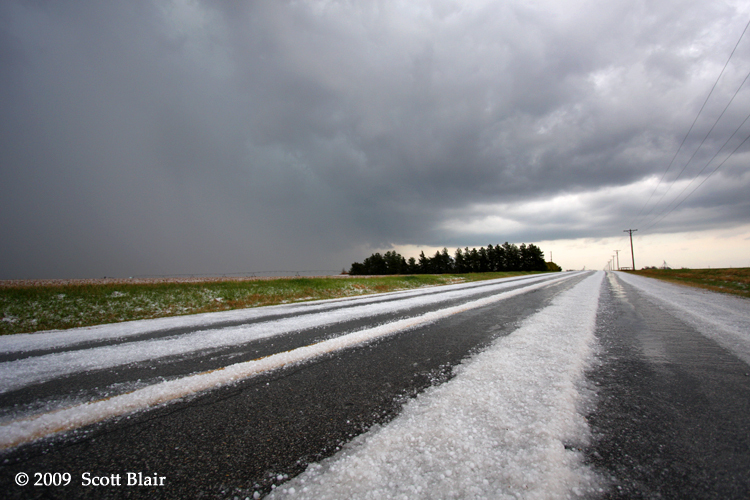 Deroche and I observed a small storm north of Burrton, KS that provided quite a hail show. The storm had a very narrow swath of severe hail and probably a short duration of severe hail as well (although the latter is unsubstantiated). This storm developed along some sort of subtle boundary, perhaps from earlier morning convection, evident by agitated low level cumulus observed in the field. The storm persisted for nearly 2 hours, but exhibited a very pulse-like nature, both visually in the numerous updrafts with time and reflectivity aloft. 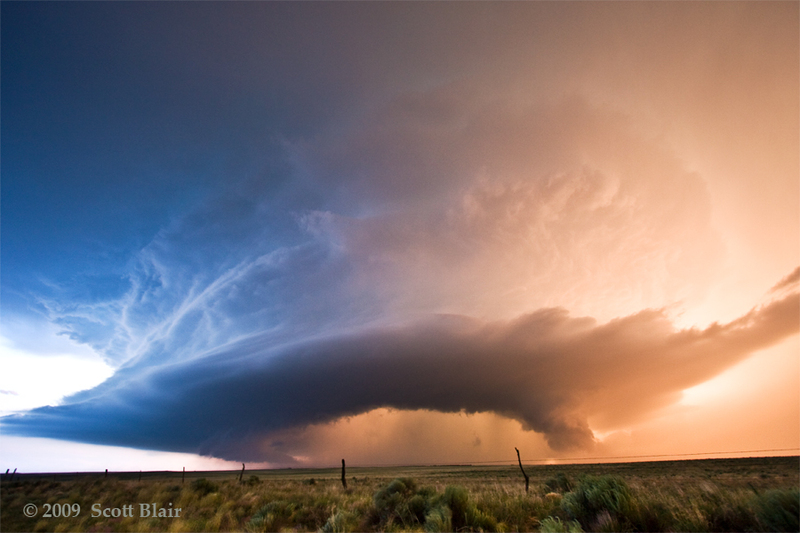 As traditionally with the case in 'cold-core' setups, low-topped convection can produce copious amounts of hail. The rate of hail accumulation was great enough to pile up on the windshields and prevent the wipers from working due to the weight of the ice. 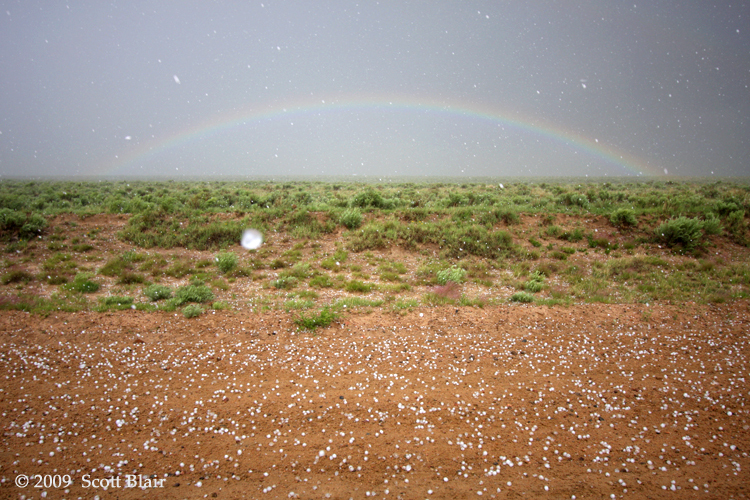 The storm passed and we measured a 0.25 mile hail swath along a local highway. The hail on the roadway created quite a hazard to local motorists, with one individual losing control and driving into a ditch. 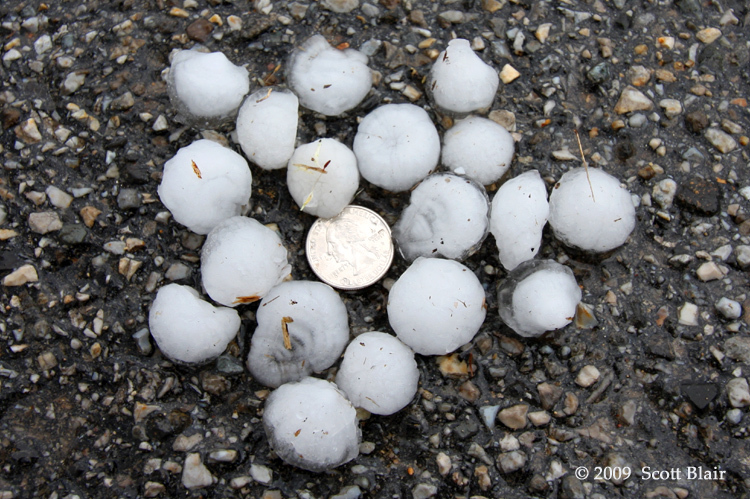 After 20 minutes of melting, we measured quarter size stones and reported 1" diameter hail via Spotter Network. Departed for a multi-day chase across the southern High Plains. 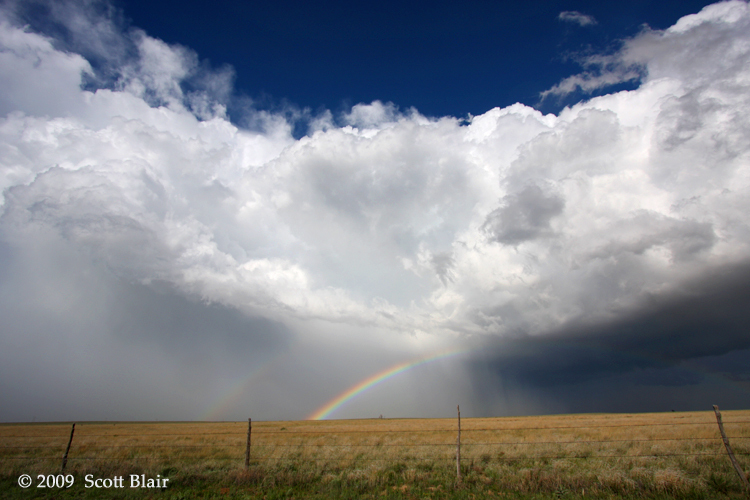 Marginal day across eastern New Mexico resulted in three supercells over the area. Deroche and I managed to find the one that didn't produce a tornado. Regardless, we enjoyed some modest storm structure north of Roswell and casually followed it along Highway 70. At its peak intensity, the storm managed a well balanced updraft and intense downdraft core with several long low level inflow tails. The storm quickly weakened about one hour before sunset, so I blasted south in hopes of observing something photogenic in far SE NM. That didn't work either, so the day ended in Midland meeting up with the COD gang. Additional Photos Here Departed Odessa, TX with an inital target near Lubbock. 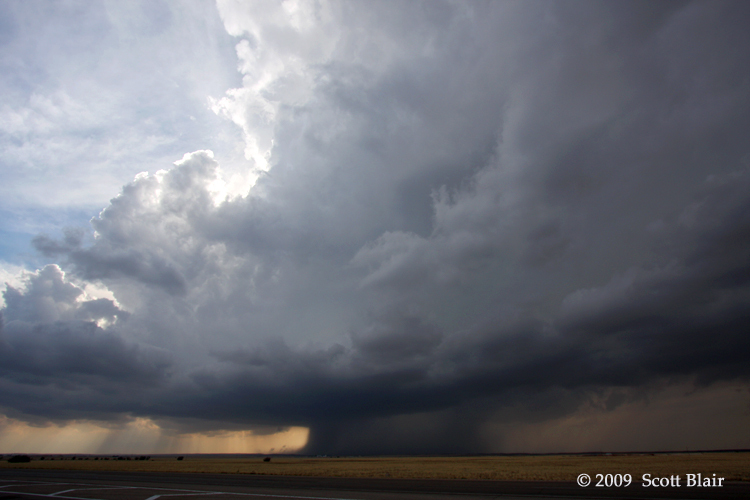 A storm developed just NW of Plainview and I followed it from mid afternoon through sunset. 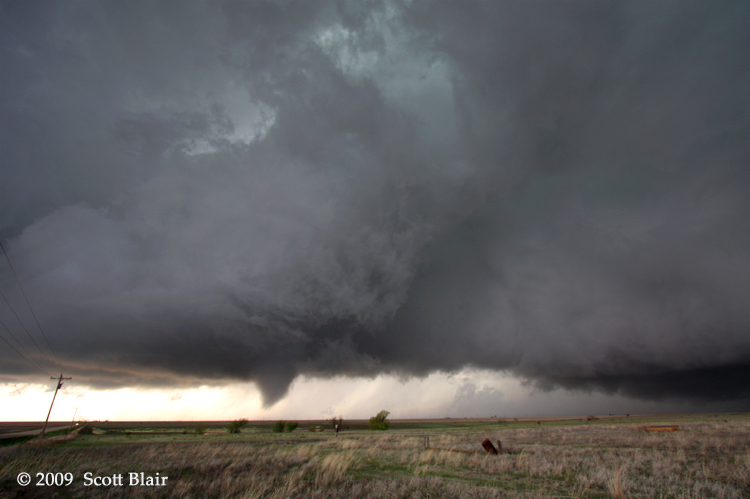 Observed 3 tornadoes near South Plains / Cedar Hill, TX. The first tornado was a long, skinny rope originating from an old occluded updraft to my north in the vicinity of South Plains. 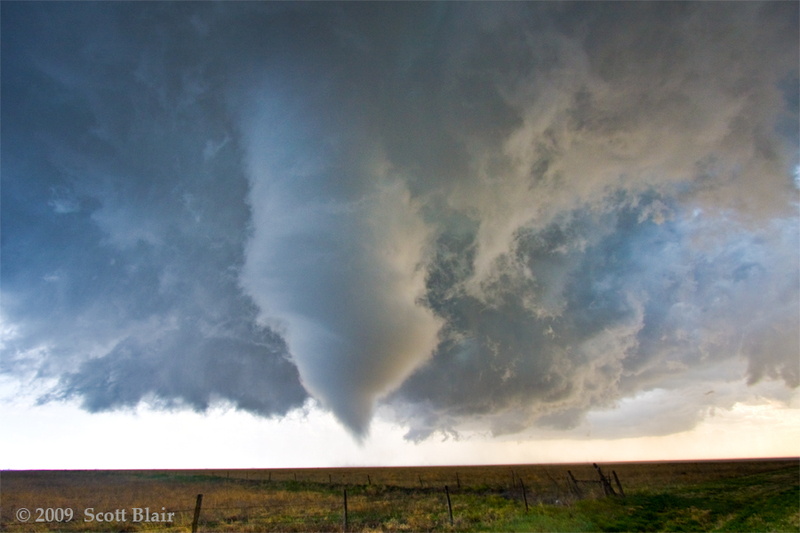 The second tornado was a spectacular fat cone that eventually narrowed with time. The tornado was approximately 10 minutes in duration from 6:10pm to 6:20pm. It crossed Ranch Road 97 roughly 2 W Cedar Hill, snapping several power poles. After crossing the road, the tornado moved ESE for its lifetime. 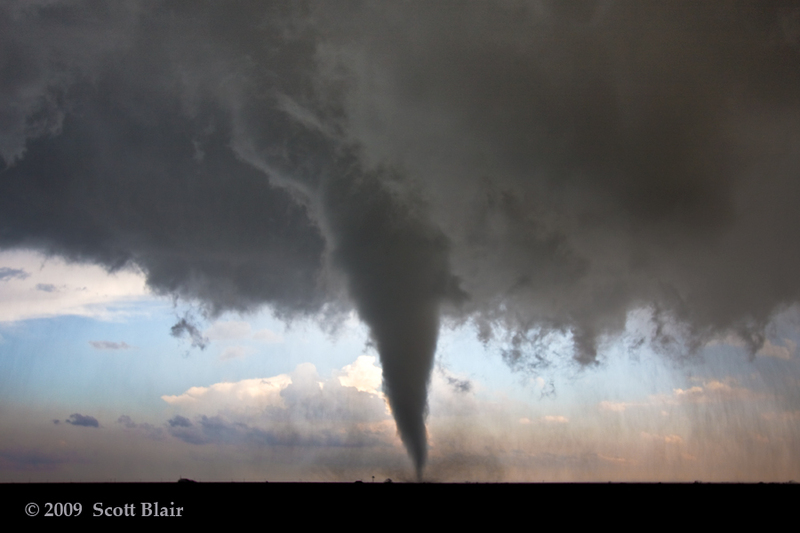 As the second tornado was roping out, a third tornado was observed from a new area of rotation to the east of the ongoing tornado. This tornado persisted for less than 5 minutes before dissipating. 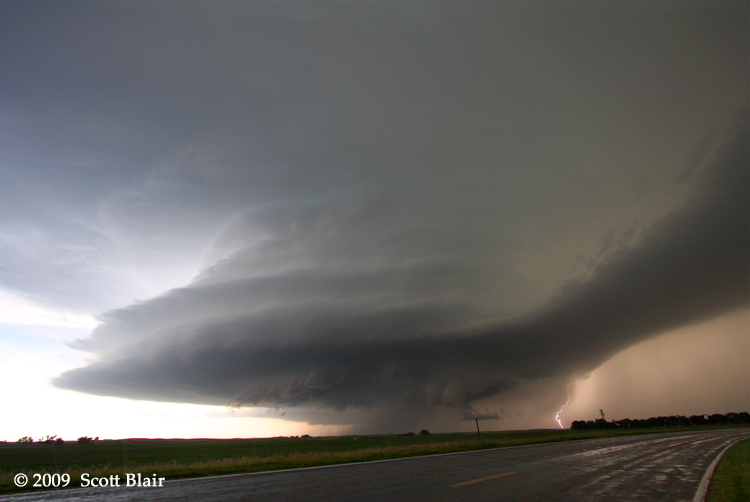 The supercell then evolved more into a HP, making additional observations challenging and providing tons of heavy rainfall and wind damage. 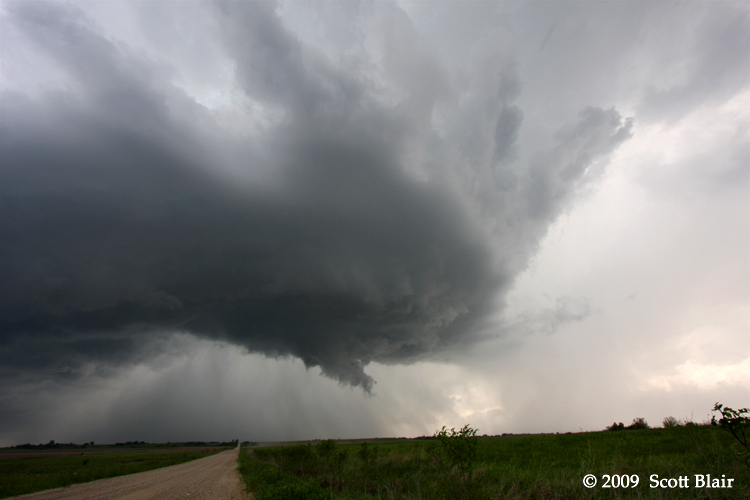 Followed a long-lived severe storm with Deroche from Emporia to Westphalia to Bronson, KS. 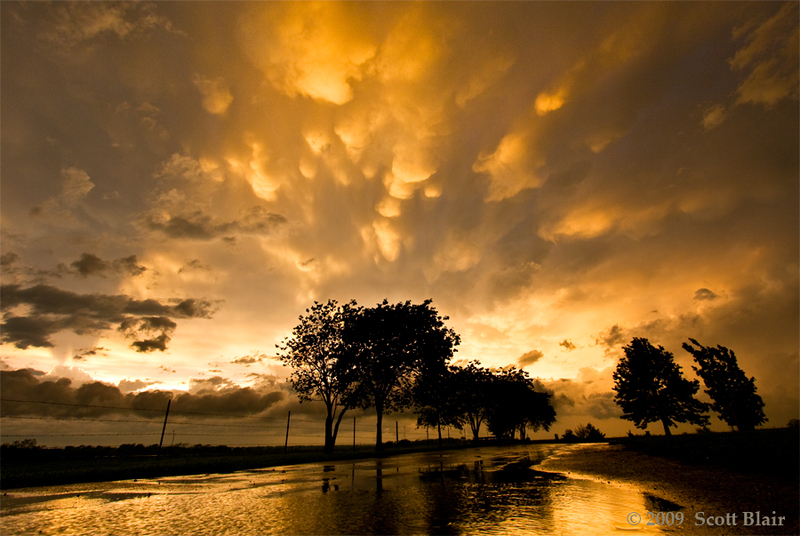 The highlights were modest storm structure, insane near-anvil cg-lightning (strike every 10-15s in close proximity), a couple rounds of golfball sized hail, and a spectacular mammatus-filled sunset near Fulton, KS. We missed a couple brief tornadoes due to repositioning. The supercell appeared to have one last chance near Westphalia, KS with a nice horseshow updraft, but eventually weakened. 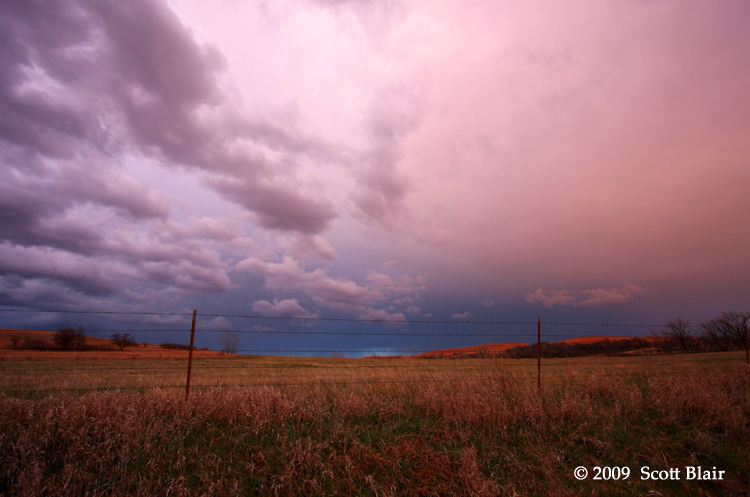 The storm merged with other developing convection and evolved into a HP supecell shortly before dark. Even though in good position, we could never visually confirm anything besides very impressive motion (both rain-curtains and cloud base). Made a long two-day drive from the Alabama coast to western Nebraska. Likewise, missed the Wyoming tornado by one hour. Beyond that, jumped on a new storm between Harrisburg and Bridgeport and it quickly matured into a photogenic supercell. This was my saving grace since the circus of chasers remained with the initial storm, which allowed the roads to remain virtually empty. 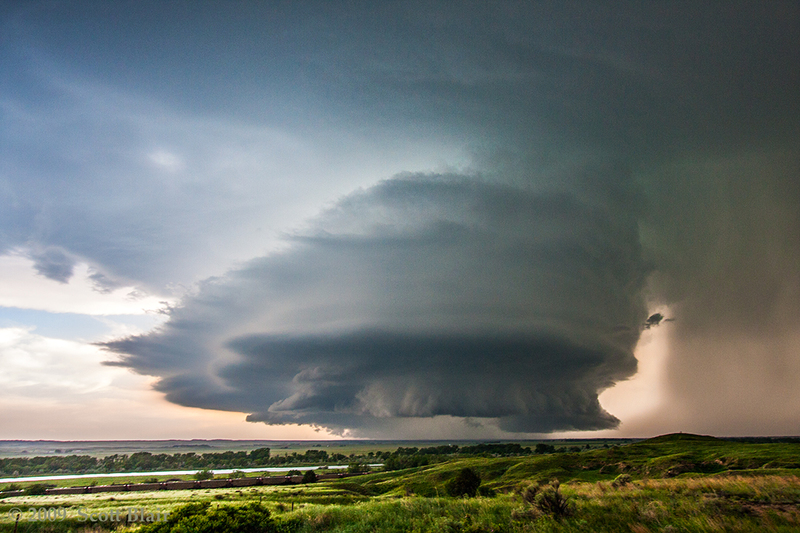 The supercell presented excellent structure throughout its lifespan. It was fairly close to producing a tornado just east of Bidgeport but cycled and began a merging process with the elder storm upstream. Followed it southeastward to Oshkosh by sunset, where a decent cloud-to-ground lightning show near the vault occurred at twilight. Started the day in Iowa and waited in Nebraska City for CI. Jumped on the first significant convection near Pawnee City, NE as a nice supercell developed. The storm quickly formed a long low level inflow tail and likewise the base lowered with time. However, another supercell evolved to the southeast, further in the warm sector and near the inflow trajectory of the current storm. Made the jump to target the new storm and crossed into Missouri at the Falls City bridge. Magliocco, Fritchie, and I skirted west of most of the precip core, but clipped the NW side of the hook. 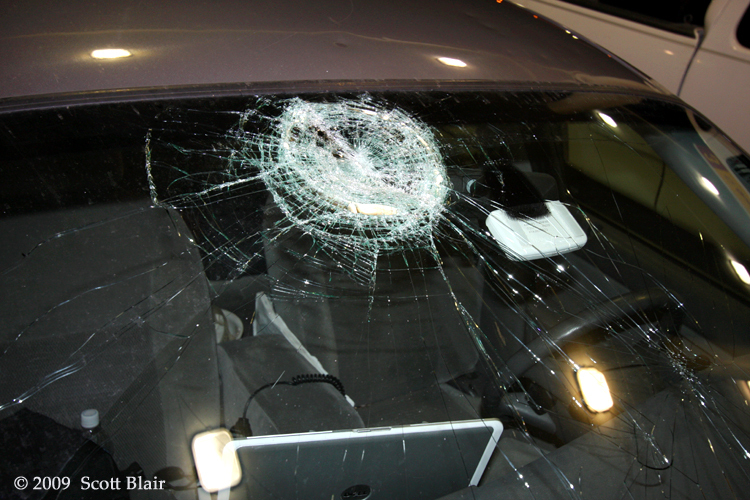 We encountered 5" to 6" diameter hail for nearly 5 minutes 4 NW Oregon, MO with one stone resulting in a major impact to the windshield. The storm made several attempts of a tornado, but failed. I was more concerned taking care of the splinters of glass throughout the inside of the car. Overall made a safe forecast for convection and likewise failed on the best target. Started in SLN and dropped to ICT before waiting for westward CI over the Flint Hills along and south of an OB. Finally CI occurred but struggled with organization and/or crossed too deep into a cold pool north of the OB. 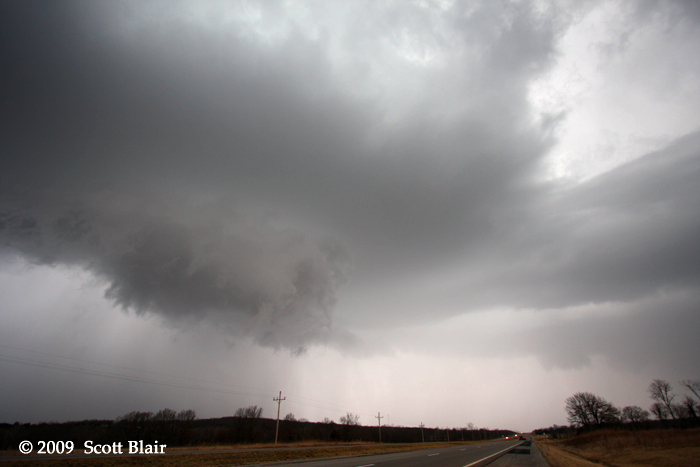 One storm had a chance and presented modest low level rotation near Moline, KS. It too eventually failed to sustain itself much past one hour and convection trended into a linear mess. The high point of the day came after Pizza Hut just north of Independence with nice lightning at twilight on the backside of convection. Started the day in GLD and made LIC my preliminary target from a road option perspective. Jumped on the initial cell north of Boone, just east of Pueblo. After being somewhat high based, it quickly organized and drifted a touch south of east, throwing up to 2.25" hail on my east dirt road option. I noticed a new large tower and low base to the south, so I elected for pavement and reemerged on Hwy 50 near Fowler. Was in good position from south of Rocky Ford to Swink to discover the southern storm's updraft had suffered some sort of traumatic dry air intrusion, perhaps from RFD. Noticing still excellent structure on the cell north of La Junta, I made a concerned effort to reposition on it. There might have been a ~2 minute tornado 5 N Hadley. A somewhat laminar-looking tube condensed under the wall cloud with obvious cyclonic motion. It maintained its structure during this duration and my initial impressions in the field was a tornado, although I was a good 5 miles away. Otherwise, it was quite a structure show! I spent a lot of time near Ft Lyon watching an amazing vault, before dropping south of Hwy 50, stopping intermittently from Caddoa to Prowers to Lamar. I was fortunate to find a rain-free overlook at sunset south of Prowers to enjoy amazing storm structure with rich color. At twilight, I had hoped to drop south of Lamar and shoot some lightning stills, but a one-lane construction zone on Hwy 287 stopped traffic just as the supercell was approaching. 2"-2.50" diameter hail in the vault crossed the highway shortly after. Starting the day in Lamar, Colorado, I decided to target the upslope region of the Palmer Divide. 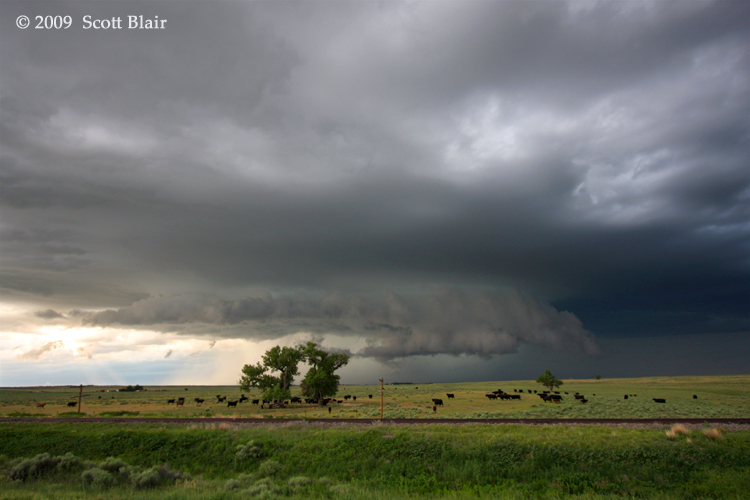 Convection initiated and evolved into a slightly elevated supercell near Silma, CO. 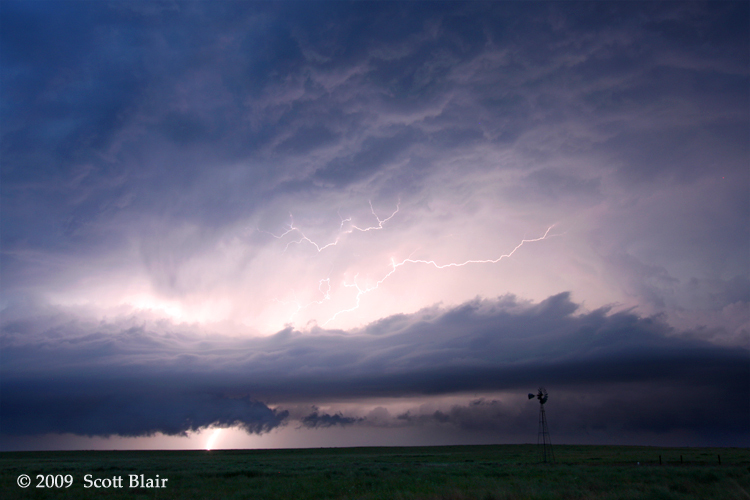 This storm remained long-lived for several hours as it turned southeast through the open plains of eastern Colorado. 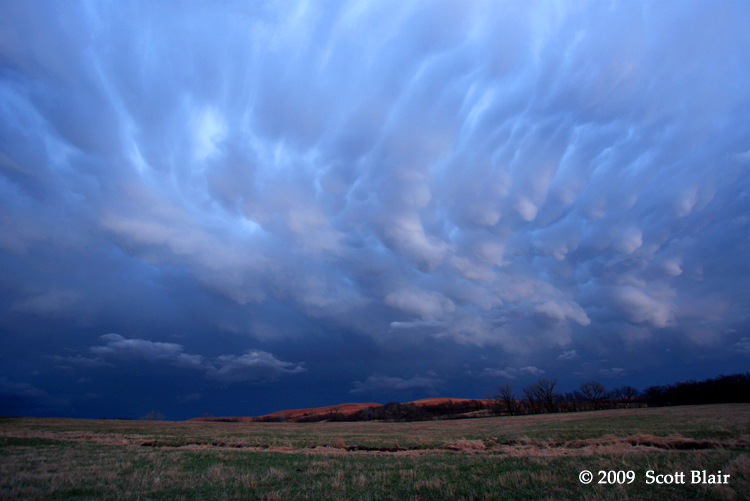 With the storm both elevated and low-topped, it was a challenge to gain good photogenic contrast. The cell slowly began to decay near sunset around Sheridan Lake, CO but provided a memorable lightning show within its exposed updraft tower. I ended the day where it began in Lamar, CO.
After spending a couple hours on struggling convection from Trinidad to La Junta, I made the leap to an awesome supercell near Kim, CO. 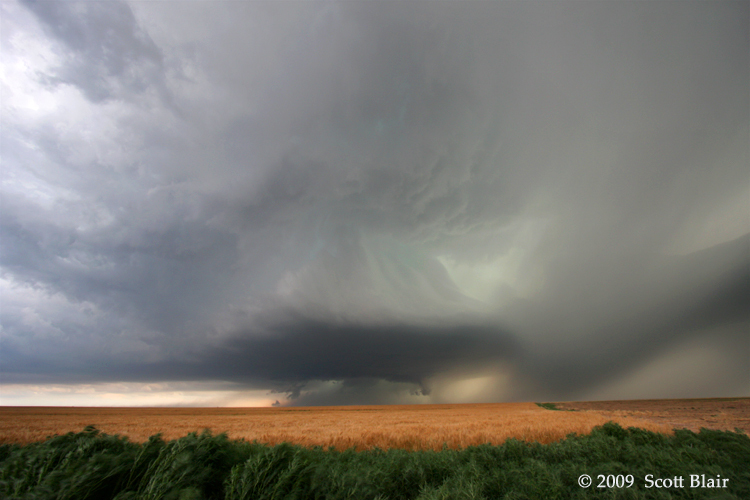 The updraft continuously fought against a surging forward flank as it moved south of Springfield, CO. I observed a brief tornado near the community of Elder, but it wasn't very photogenic from my perspective. The storm acquired deeper moisture as it moved into Kansas and the inflow significantly increased towards evening with impressive dual inflow jets into the updraft region. The storm produced a large microburst near the vault region at Richfield, KS and slowly began to lose organization as it moved into Hugoton. 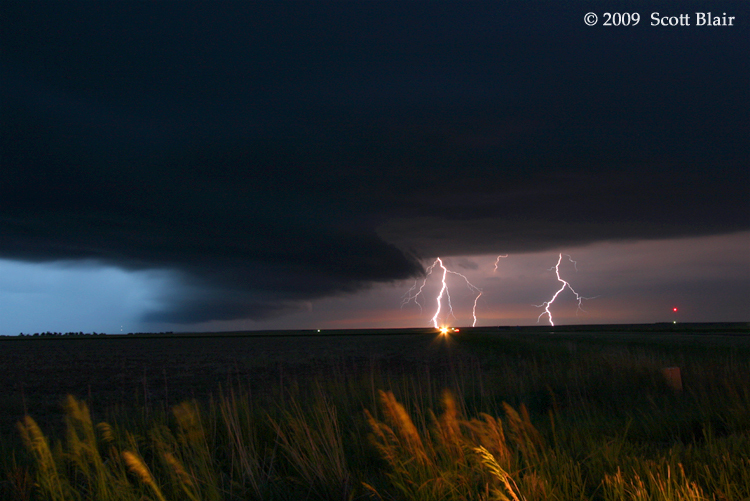 An awesome lightning show commenced at sunset, which was a fitting end to my 2009 chase vacation.